Sewing Like Mad: Fashion Star...no no no not me...the TV program!! Is there something American business' are good at it is using ALL the opportunities for making money! And that is a complement - I don't blame them. This dress is a bought pattern from the TV program Fashion Star. By the way I find this program extremely interesting because this contains bits of the real fashion world. Okay you might not find yourself in front of a buyer from such big retailers the first couple of seasons but at least the contestants are forced to think about consumers and hanger appeal instead of high flying ideas that is not working in the real world. Okay the world does need a few designers that make art and we also need designers that make clothes that pushes fashion in new directions but in my opinion do we mostly need designers that make clothes that people want and can wear. Hmmm, that was not exactly that short but at least I got that of my chest. 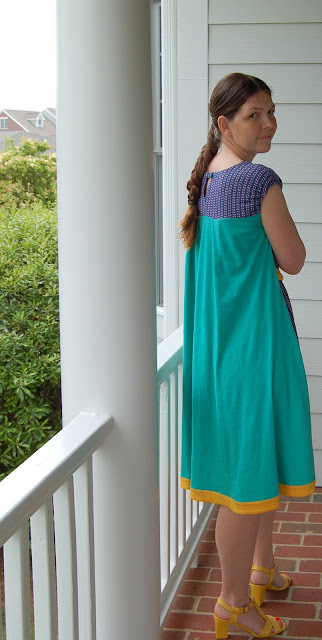 And now back to the opportunities for making money because not only has the TV program made sure we can buy the clothes we can also buy patterns and sew some of the styles and this is one of them. 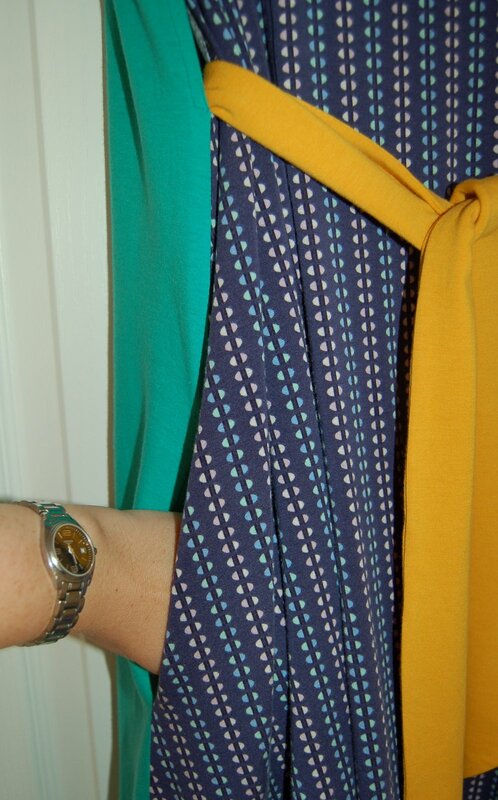 This dress is special in the way that it has holes in the side seams at the waist for the belt. The belt goes through the holes so you can only see it from the front and the back of the dress is loose. That gives a dress that has a different shape whether you see it from the front or the back and that is cool if you ask me. I saw this shape the first time a couple of seasons ago from my favorite Danish fashion company Baum und Pferdgarten, which I have had the pleasure of working for a couple of times on a freelance basis, and since then has this type of dress been on my one-day-I-will-make-this-type-of-dress-list. But that list is long and when I suddenly got the pattern served on a platter for around $10 well then I was in. The dress is made in soft cotton jersey material (that is what the pattern is made for) but because the model is so loose it should work in woven fabric too. Will be tested later, okay! I changed a few things from the original pattern. I made the neck line more open. It went all the way up and that did not say summer dress to me. Then I added the band on the bottom of the skirt.....well, just because I like that extra pop of color down there. And then I added elastic on the top of the sleeve openings. I wanted it to follow my arm more than the original design was intended and I think the gathering gives a nice look to it. This dress definitely has hanger appeal after my opinion. Especially from the front. I love those colors together. And yeah it was of course because I did not have fabric enough that the back ended up being another fabric but I really love the result. I hate to sew pockets but love to have clothes that has pockets. With this dress I decided to be a good girl and make this dress nice and complete. Maybe it had something to do with the fact that I knew you were going to see it? Oh and this photo below is an example of how important ironing is for the finished result. I mean look at this band before ironing. It looks very amateurish and is basically a mess. And wupti look at it after some pressure, heat and steam from a normal household iron. If not professionally looking then at least much better! Nice job! I always want to skip the ironing, but here's yet more proof that I shouldn't. Very unique pattern, but very cool! What a pretty dress,who wouldn't love it! 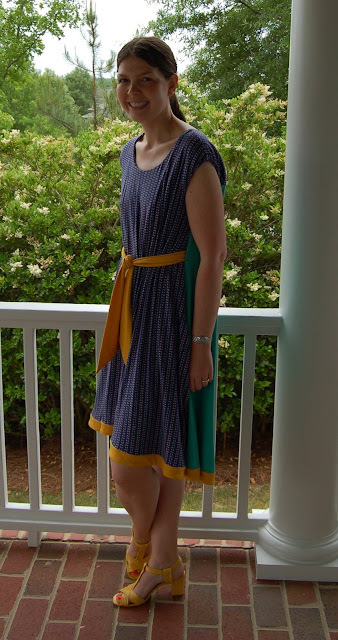 I love this dress and the fabrics you used! Btw...I just "discovered" Fashion Star this past week, I am in love!